Knoll Guest House01263 512753work Guest AccommodationRelax, unwind and enjoy all that Cromer and the area has to offer. We are here to give you all you need to enhance your stay; a welcome smile on arrival, comfortable bedrooms with all the mod cons you expect, including WiFi access, a hearty breakfast, keys to the front door, even buckets and spades. Knoll Guest House is situated on a quiet street just off the sea front. There are sea views from 4 of the 5 en-suite bedrooms, the fifth room being on the ground floor, looking onto a small private garden patio. 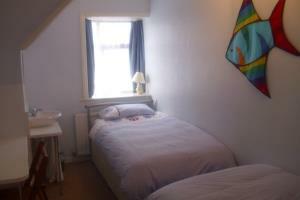 One bedroom is a family room with double bed and in adjoining room 2 single beds, children are more than welcome. Our rates include breakfast; however with prior notice we can offer a dinner menu and even packed lunches. The Railway station and main bus stops are a 5 minute walk from the Knoll and if you are arriving by motorbike or cycle we have undercover, secure storage. Make Cromer your break destination this year, whether for a weeks holiday or just a few days get away. Relax, unwind and enjoy all that Cromer and the area has to offer. We are here to give you all you need to enhance your stay; a welcome smile on arrival, comfortable bedrooms with all the mod cons you expect, including WiFi access, a hearty breakfast, keys to the front door, even buckets and spades. Here at the Knoll you will be made to feel welcome and hopefully be back again next year. Cycle storage available. One ground floor bedroom en-suite. Children welcome from any age. Turn into Alfred Road from A149 adjacent to Cliftonville Hotel situated on the left hand side from sea front.